If you suffer from dry eye, you know the discomfort and disruption it causes each day. That’s why Alan Schlussel, O.D. created the Dry Eye Treatment Center Of NY and The Dry Eye Treatment Center of NJ. Dr. Schlussel has been treating patients with dry eye with some of the most innovative new technologies. Dry eyes, or dry eye syndrome, is one of the most common eye and vision problems today and can become more severe if left untreated. For treatment visit Dr. Schlussel and his Center for Dry Eyes in NYC (Manhattan) and Center for Dry Eyes in West Orange. If you have dry eye syndrome, you know the daily discomfort it causes. To help patients overcome this disruption Alan Schlussel, O.D. created the Dry Eye Treatment Center Of NY and The Dry Eye Treatment Center of NJ. Our eye care specialist has been treating dry eye patients with some of the most innovative optometry technologies. Dry eye syndrome, is one of the most common eye conditions today, left untreated it can cause even more discomfort and damage over time. For consultation and treatment visit Dr. Schlussel and his Center for Dry Eyes in NYC (Manhattan) and Center for Dry Eyes in West Orange. 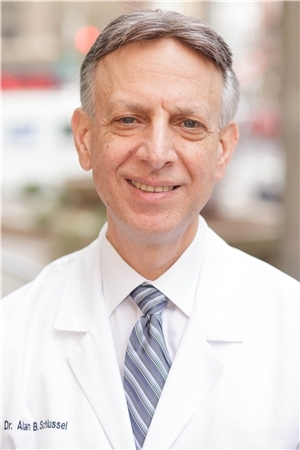 Dr. Alan B. Schlussel O.D., F.A.A.O. We're located on the corner of Third Avenue and East 33rd. Click on the Google Directions below and enter your starting address. Directions will be shown to our Manhattan, New York Dry Eye Treatment Center. Click on the Google Directions below and enter your starting address. Directions will be shown to our West Orange, New Jersey Dry Eye Treatment Center. Dry eye syndrome has several causes. Click the image to learn more about the causes of Dry Eye. Before looking at more invasive options, like punctal plugs or other plug-n-drop methods, we have general tips for you about dealing with Dry Eye. Learn about those tips and more by clicking the image above. You will see all the treatments we have to offer you for Dry Eye relief. For cases of severe or chronic tear-film insufficiency, our New York City Dry Eye doctors will sometimes use punctal plugs. These are small devices that are inserted into the tear ducts to slow or even block the drainage of tears. This increases the tear-film and moisture present in the eyes. Get Checked By Our NYC Dry Eye Doctor Today! To avoid dry eye problems, visit Dr. Alan B. Schlussel O.D., F.A.A.O. of New York or the Dry Eye Center in New Jersey by booking an appointment online - click here to book your dry eye exam and tear film evaluation appointment now. Help spread the word about dry eyes and Dr. Alan Schlussel! Write a review of our New York office or West Orange office on Google. Dr. Schlussel's dry eyes offices are conveniently located. Visit The Dr Eye Doctor at our dry eye center in New York or our dry eye center in West Orange, New Jersey.